After a night of drinking, 28-year-old Elizabeth Otero jumped into the driver’s seat of a parked yellow cab on Mercer St. in Manhattan and sped off, according to a criminal complaint. She had had a blood-alcohol content of 0.22 when cops found her, and she also told officers she’s never had a driver’s license. 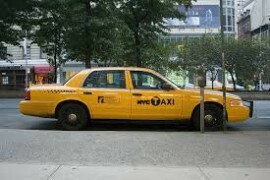 A drunk woman jumped into the driver’s seat of a yellow taxi and took off as the stunned driver stood nearby, police said. Elizabeth Otero, 28, who does not have a driver’s license, slipped into the idling 2014 Toyota Camry at East 12th Street and Fifth Avenue at 3:53 a.m. on Dec. 7, police said. A police officer tracked the cab using the taxi company’s GPS system and found Otero a mile and a half away, in front of 90 Mercer St., police said. Otero was still sitting in the driver’s seat with the engine running when police discovered her. She was slurring her words and her breath smelled of alcohol, police said. Police said she was given a breathalyzer test about 6:10 a.m. and that her blood-alcohol content was .229 percent, or nearly three times the legal limit. Otero was charged with criminal possession of stolen property, grand larceny, operating a motor vehicle while intoxicated and aggravated driving while intoxicated. She also received an infraction for operating a motor vehicle without a driver’s license. She told an officer that she has never been licensed to drive a car, police said.